As we all know, carpeting throughout a home can be a costly investment and a high risk to tenants living in a rental. Especially if pets are allowed inside the home. Truth is, these pets can leave behind contamination not seen with the naked eye. These contaminations can turn into unwanted odors over time that may be hard to eliminate if not taken care of promptly and properly. Also pet urine and its dry residue can affect the air quality and health of those living in a home. Don’t be held accountable for what’s not yours! If you are renting property, a carpet inspection could prove to be a very valuable asset to you, especially in disputes with property managers or landlords. Keepín It Kleen can provide a third party technically written report containing documentation & photographs you may need to legally retain your security deposit. Generally, inspections are purchased before move in and after move out. 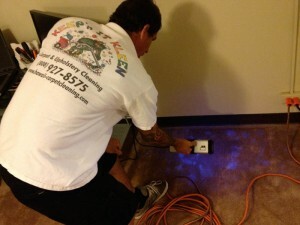 Keep’n It Kleen will start with a thorough walk through detailing any stains or damage such as bleach stains, colored stains, holes, tears, loose or open seams, loose carpet or ripples, loose or worn out tack strip, an estimated age of carpeting, and wear condition of carpet. 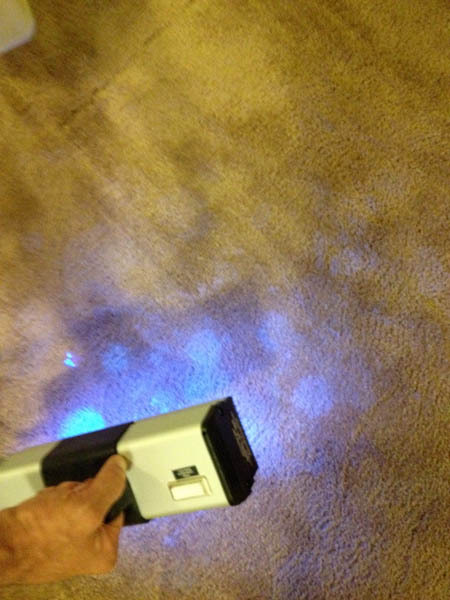 Next we’ll scan all carpeted areas with a high intensity, long wave ultraviolet inspection light to pinpoint any urine stains not seen with the naked eye. We will then provide a technically written report containing documentation & photographs.